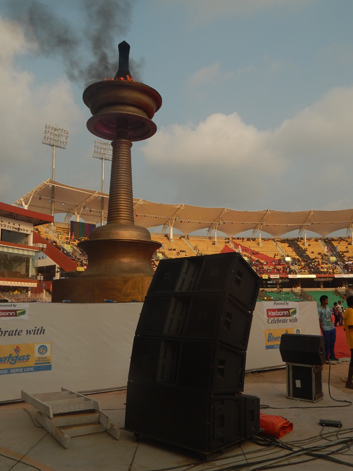 SOUND.COM, leading provider of sound reinforcement and turnkey audio solutions, was chosen to provide the audio solutions for the Opening & Closing Ceremonies at the National Games, 2015, held at The Greenfield Stadium in Karyavottam, Trivandrum, Kerala. For SOUND.COM, The National Games Opening & Closing ceremonies is a very important event in the calendar. 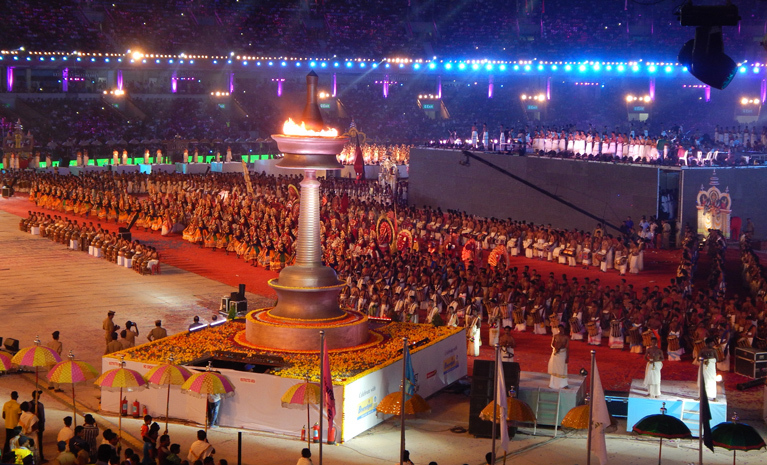 Right from the time the company managed sound for ‘The Commonwealth Games 2010’ in Delhi, it has taken sporting events to the next level in India. Other important ceremonies like ‘The Indian Premier League’ (Cricket) ‘Indian Super League’ (Football) and The National Games 2011, Ranchi have also been supported by this ceremonies audio specialist in India. The highlight was that it was a debut project for the company in the state of Kerala and was decided over an e-tendering process. Needless to say, SOUND.COM’s credentials on ceremonies and sporting events helped them clinch the project and here are the details of how it panned out. 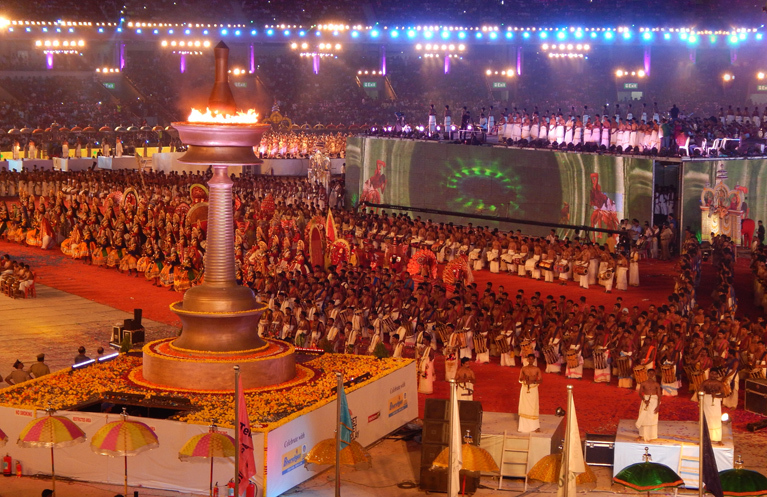 The ceremonies and the games were held in the newly built stadium by IL&FS and this would be the first event in a stadium that contains infrastructure par-excellence. Equipment: Technically the stadium was configured for a PA system in the round consisting of 24 stacks of VerTec speakers in a configuration of 3 line array elements + 1 sub & a field of play loudspeaker consisting of a SRX712M facing the opposite as monitoring for talent in the field. 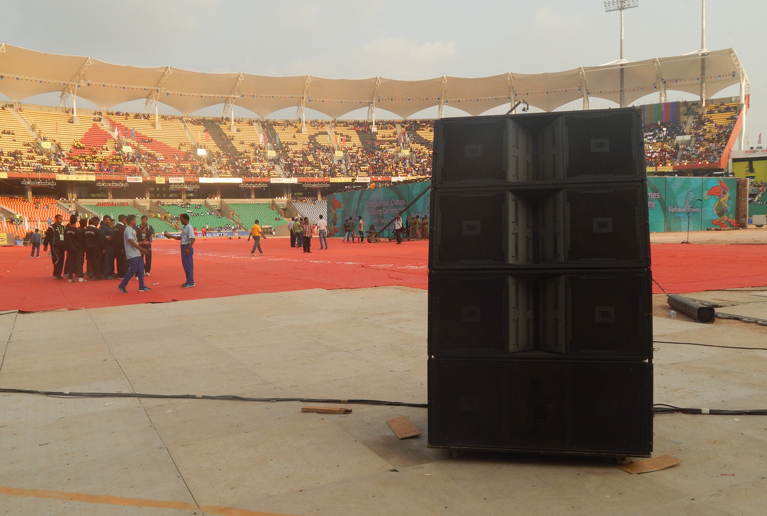 Perfect coverage was provided in the stands using very good set of measurement devices and JBL’s line array calculator. All this data is fed in the Performance Manager file that serves as the main command center for all loudspeaker systems. The entire PA system was powered by Crown ITech-HD12000 amplifiers for the Main sound system and ITech-HD4X3500 for all VIP & Monitoring amplification. However the heart of the redundant digital audio transport system is driven by Optocore, a total of 6 nodes across the stadium make up the closed ring which forms a robust digital routing matrix. This revolutionary system by the Munich based company was the backbone of all the audio deliverables, and not only the optics are a closed loop in a ring topology to provide robust cable redundancy, but further redundancy is offered by the dual power supplies in their devices just like the consoles. What this means is that even if there was a power outage, the sound to the broadcast would still be on and all control systems would continue functioning. 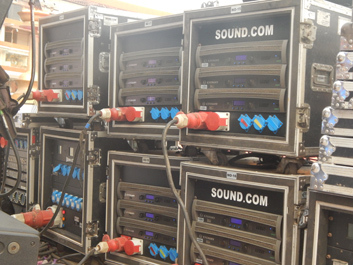 SOUND.COM ran an Optocore node in the North, South, and East & West of the stadium as well as a FOH node and Monitor Node. At this particular ceremonies all the VIP tribune podiums and Athletes Oath were picked up from the Optocore X6R-FX devices from the west node and routed straight to the Soundcraft Vi6 console that served as the main mixing console, while the Yamaha CL5 was used to mix all the protocol events. Sufficient back up planning is an integral part of planning for ceremonies audio and the team ensured every speech microphone is coupled with a wireless back-up system, for example although the VIP tribune is picked up on the Optocore system, a Shure UR3 was used to pick up the back-up. Likewise with the Athletes Oath microphone Shure Sm58 wired line backed up with a wireless Shure UR2 with a 58 capsule. The core team comprised of Sunil Karanjikar, Chief Systems Engineer and Warren Dsouza, Audio Director. Both of them possess extensive and unmatched experience in ceremonies audio & special events in the Indian sub-continent. Managing the RF challenge: In an event of this scale, RF is crucial and RF extremism is required to endure the distances and if not integrated properly, can just destroy an entire show. Staring with WinRadio systems, the team scanned the entire place for troublesome frequencies and then allocated suitable ones for the radio microphones. Considering all the bells and whistles in RF, be it low loss cables, distributors, boosters, networking one had to make a contingency plan in case we ran into problems during the show with rogue frequencies. IEM deployment is a bigger challenge in stadiums in comparison to radio mikes and once the IEM body pack is draped onto the talents body its RF capabilities literally drop by 1/3rd. IEM’s are often underestimated and are perceived to have gain to carry through but that isn’t true. So the right combiners, Helical Antenna & small cable lengths are not enough to do the distances. However, the SOUND.COM team managed it just well because we have great RF application engineering techniques over various demographics in India and abroad. The main stage also had mirrored frequency receivers of FOH, to pick up signals as back-up in case the main receivers ran into a reception related problems. “Our contingencies drive the rookies who recently join us nuts as to why we need to be so particular about reliability. It’s just that we have made it a habit. We also make them understand that we are not going out of our way to do this, we just are conducting ourselves in the most normal and professional standards set internally. At the end of the day, one can only feel satisfied with a job well done. Every job that has been done at SOUND.COM is for posterity and enough to motivate us to scale higher. At the end of the show, nothing sounds better than the National Anthem resounding through your sound system in the Stadium at the end of the Closing ceremony. That feeling is priceless!” said Warren D’Souza.